Welcome to the Central Medical Library (CMK)! You can join us, request material and buy textbooks from October 1st onwards. To save time, you can print a copy of the Application form and complete it in advance of your visit. Remember to bring it with you when you come. The Library is located at Vrazov trg 2, Ljubljana. Take the stairs up to the 1 st floor, go past the Secretariat and the office of the Dean until you come to the glass door, the main entrance to the Library. For more information see the the Library map. Atlas of Human Anatomy, Vol.1, 15th ed. Below are just a few ways you can learn about the Library, its resources, and services before classes begin. On their first visit exchange and regular students have to provide two forms of identification: a personal ID/or a passport and a Student ID card/"indeks" or a confirmation of enrolment. There is no charge for exchange students at The Faculty of Medicine, University of Ljubljana. When you have the material that you would like to borrow, present your Student ID card (or some other sort of identification). Users can borrow items from the Library if there are not any outstanding charges on their Library accounts. »Reference only« items can only be used in the Reading Room until closing time. Books can only be loaned to Library members with a valid Student card. Students can borrow up to 15 items at a time. Faculty of Medicine students can borrow core textbooks for 3 months, and additional readings for 1 month. Readers are responsible for any item issued to them. Journals may be borrowed for a maximum period of six days, with the exception of thematic issues, which are loanable for a period of one month. Orders can be forwarded to the Library by e-mail (izposoja@mf.uni-lj.si). 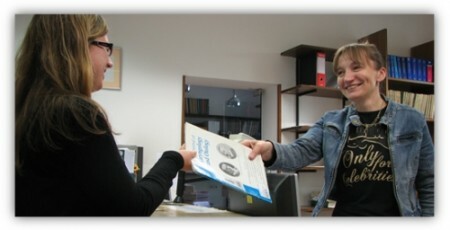 Print and electronic forms are also available on the web pages (http://www.mf.uni-lj.si/cmk). Books can be renewed only once for one month before their due date. They can be renewed by phone, email (izposoja@mf.uni-lj.si) or via COBISS/OPAC, My Library at http://cobiss.izum.si/. Please ensure you have OPAC username and password, both can be obtained from the Circulation Desk. All users can reserve items via COBISS/OPAC- My Library, in person, by phone or email. A total of three items may be reserved if your present loan does not exceed 15 items. Items are held in the Library for three working days, the fine is charged if the reserved material is not picked up by a patron in time. If books are not returned or renewed by the due date, the Library charges fines at the rate of 0,25 € per book per day overdue. For »Reference only« items, the charge is 5,92€ per unit per day. Library sends overdue reminders through email and post. Patrons are charged: 0,47€ for the 1st overdue reminder, 0,95€ for the second , 2,05€ for the third and 3,15€ for the final overdue reminder. Readers will also incur fines for the items that have been lost or badly damaged (eg. text being underlined, etc). All items have to be returned and charges to be paid before the students finish their studies at the Faculty of Medicine Ljubljana. Materials that are unavailable in the Library, can be obtained from other Slovenian and international libraries through an inter-library loan service. ILL forms are available at the Circulation Desk or can be forwarded to the Library by post, fax or email to the following address illcmk@mf.uni-lj.si. All the ILL requests are subject to fees depending on the type of service. Portal CMK is an interface to access the Library's numerous services and e-resources including Digital Library CMK, a list of core textbooks and other useful information. Digital Library CMK is a broad collection of licenced e-resources (full text e-journals, e-books, databases) as well as freely available titles to support study, teaching, research and clinical practice. It is available 24/7. There is also a wonderful selection of e-books in the Digital Library CMK to support your course of study. We highly recommend using Access Medicine and Sobotta - Atlas Human Anatomy as well as many others. On-site access: If you are at the Library or the Faculty, most of the e-resources can be accessed directly from the Library's web pages. Go to »Portal CMK« and click on the menu »Digital Library«. Off-site access: Most of the e-resources can be accessed off-site, allowing you to work from home or from another location. Click on the menu »Off-site access« and log in with your OPAC username and password. In case you need a username or a password, ask a member of staff at the Circulation Desk or email infocmk@mf.uni-lj.si. There are 20 desktop computers in the Library. They all have standard Microsoft Office software, Acrobat and a choice of Internet browsers. Prints from all the computers in the Library can be obtained from the Reprographics Department or both issue desks for a fee. The Library IT specialist will also help you with setting up the account so please contact one of the Issue Desks when you need help. The Library provides a variety of study spaces for students on both floors. These range from individual study spaces for quiet study to group study rooms where students can work together. The Library has two silent zones- one on the first floor and one on the second floor. These areas are intended for absolute silent study. There is a refreshment area on the first floor (at the end of the main hall) with vending machines where you can get hot and cold drinks as well as other snacks. A tutor provides help with your library research, guides you to books, journals, databases and other resources, shows you how to use the digital library, explains »Remote access« etc. »My Library« at http://cobiss.izum.si/ is used for an off-site access to e-resources, renewing and reserving books. For a password/user name, please contact the Circulation desk or your tutor. Prepared by Nana Turk, Stanka Jelenc, Darko Majcenović, Vesna Cafuta and Anamarija Rožić.